Wild and prolific Japanese “death-jazz” sextet Soil & “Pimp” Sessions sound on first listening like a particularly worked-up version of bebop and post-bop, but don’t be fooled, this is no retro outfit. These guys are forward looking, resuscitating the idea of a jazz band that can bring a room to its feet. 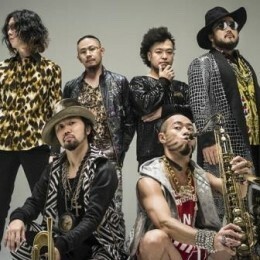 Band members Shacho (agitator, spirit), Tabu Zombie (trumpet), Motoharu (sax), Josei (piano), Akita Goldman (bass) and Midorin (drums) originally met at a club event in Tokyo in 2001. Since then they’ve driven countless nightclubs into wild frenzies, sounding like a band that enjoyed late-90s trip-hop and acid-house, but preferred to follow the breadcrumb trail back to those genre’s sources in pure jazz. Throughout their career they have captured crowds from Tokyo to Montreux where they haven’t stopped packing the dance-floors with their sweat-drenched high-energy jazz. The band’s fifteenth album ‘Black Track’ was released earlier this year.